Ahhhhh, comforting ! 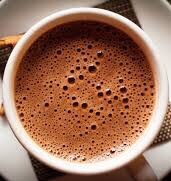 A nice warm cup of drinking chocolate with chai spice! Perfect for a cozy fall, or winter evening!! Place all ingredients in a medium size sauce pan. Bring to a rolling boil and whisk until spices and cocoa powder have dissolved. Reduce heat and let simmer for 3-5 minutes until flavors have combine. Combine spices together. Mix well to combine. Store in an airtight spice container.